A student at the Bauhaus University works on his project in the metal workshop, in Weimar, eastern Germany, on January 15, 2019. Bauhaus, the design school that left its mark on everything from teapots to tower blocks and iPhones to Ikea, marks its centenary this year, touching off a politically charged debate about its lasting impact. John MACDOUGALL / AFP. Tomás Saraceno, Installation view at Tanya Bonakdar Gallery, Los Angeles, January 12March 2, 2019. Photo by Joshua White. Courtesy the artist and Tanya Bonakdar Gallery, New York / Los Angeles. Elizabeth Jane Gardner Bouguereau, La Captive, signed Elizabeth Gardner (lower left), oil on canvas, 68 by 47 in. 172.7 by 119.4 cm. Estimate: $250/350,000. Courtesy Sotheby's. Marc Newson, Chair, 2017, cast glass, 29 1/8 × 27 1/4 x 21 5/8 inches (74 × 69 × 55 cm) © Marc Newson. Beverly Pepper, Bedford Column, 1980. Bronze, 21 3/4 x 5 3/4 x 5 1/4 inches, 55.2 x 14.6 x 13.3 cm. Images courtesy of the artist and Kayne Griffin Corcoran, Los Angeles. Nicolas Deshayes, Blister, 2018, glazed slip-cast earthenware, 13 x 31 x 26 cm, 5 1/8 x 12 1/4 x 10 1/4 ins. Photo: Robert Glowacki. © Nicolas Deshayes. Courtesy the artist & Modern Art, London. Jessica Lange looks at a work of art at the Outsider Art Fair. Photo: Olya Vysotskaya. Installation view of Richard Artschwager: Self-Portraits and the American Southwest. Egon Schiele (1890-1918), Femme debout se couvrant le visage avec les deux mains, 1911, gouache, aquarelle et crayon sur papier, 44,7x31,5cm, signé et daté au centre à droite. Oliver Beer. Photo: Benjamin Westoby. Paul Stephen Benjamin, Ceiling, 2017. Tempered glass Dimensions variable, 16 x 24 inches, 40.6 x 61 cm. Edition of 3, with 2 AP. Courtesy of the artist and Marianne Boesky Gallery, New York and Aspen. © Paul Stephen Benjamin. Photo: Jason Wyche. April 20, 1875. Jean-François Millet (October 4, 1814 - January 20, 1875) was a French painter and one of the founders of the Barbizon school in rural France. Millet is noted for his scenes of peasant farmers; he can be categorized as part of the Realism art movement. 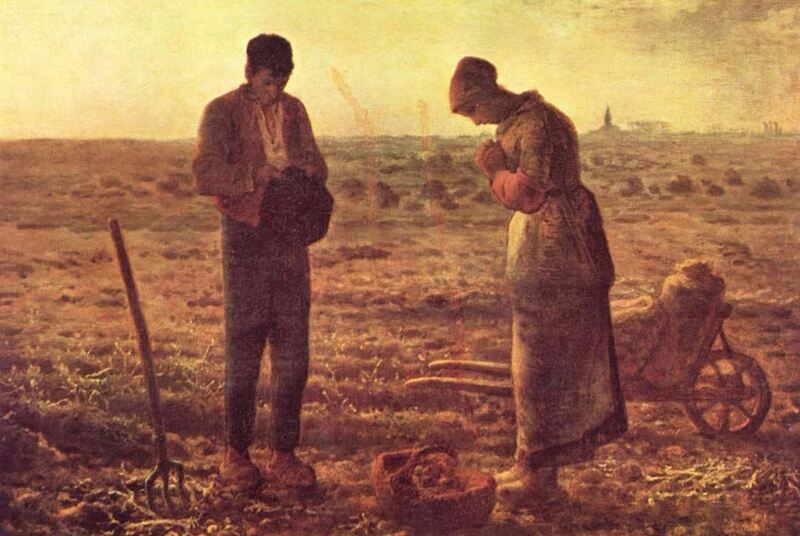 In this image: The Angelus by Jean Francois Millet.